I talk a lot on this site about time-saving game plays for delivering great dinners on busy weeknights. One of my favorites is the “Saucy Two-Step” (yes, dance reference intended!). This involves making a great, flavorful sauce on the weekend, freezing some of it, and using the rest for dinners during the workweek. 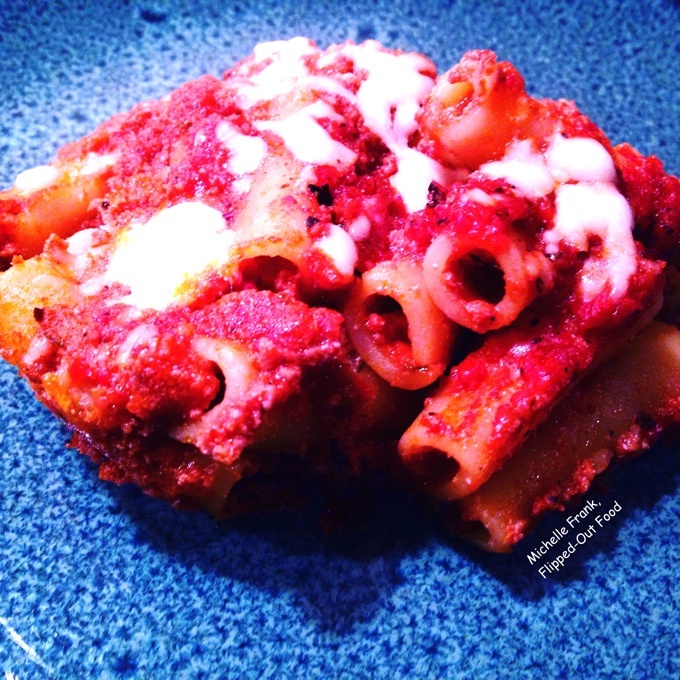 For Baked Pasta Casserole, I will have made either Marinara or Bolognese sauce over the weekend (you can find the recipes here and here). Better yet, I have some sauce in the freezer already and it’s just a matter of thawing it! Last night’s dinner was likely spaghetti Marinara or Bolognese. Now I take the rest of that sauce and incorporate it into a pasta dish with ricotta cheese and whatever pasta shape I’m in the mood for. Sometimes I have pasta odds and ends, so I shake things up and make a mixed-pasta casserole (paying careful attention to varying cook times: we don’t want droopy spaghetti and chewy rigatoni!). As it turns out, the kids prefer spaghetti, so that’s my pasta of choice these days. I break it up into 1-inch pieces before boiling, but that’s not mandatory. Here’s the diabolical part of Baked Pasta Casserole: It’s a nearly flawless undercover veggie-delivery system. Why do I resort to such measures? Let’s back up for a moment. 2 out of 3 of our kids are good eaters and dutifully eat their veggies without complaint. The third…not so much. The very idea of 90% of vegetable-type food makes him gag (or at least give us a very convincing almost-puking performance). We can’t quite pin him down on what he specifically finds objectionable about vegetable matter. Any crunch is right out…although raw carrots are, contradictorily, just fine. Vegetables that are visibly mixed into a dish are systematically weeded out to be suffered through—separately—later. Now, anyone getting up on their high horse to point the finger at me for bad parenting can get right back down again. I’m a late-comer to the Frank household (more on that here). Although I was raised to clean my plate “OR ELSE,” that’s not how these kids have been raised. I don’t condone the “or else” strategy, nor am I a fan of making kids feel personally responsible for a child starving to death in a third-world country because their broccoli isn’t finished. As any stepmom out there is well aware, it takes baby steps to mesh your parenting style with your spouse’s. Or, really, to even find your voice as parent in your new, blended family. It’s tricky, because you must earn the acceptance, love, and respect of your new children. But it’s also imperative to stick to established household rules. This means sometimes asking the kids to do unpleasant things, like cleaning their rooms or eating vegetables. I don’t have kids of my own, so parenting has been a completely new thing to me. To complicate matters, we split the kids evenly between two households. And so—right, wrong, or ambivalent—they have different parenting every other week, which has got to be tough on them. I always try to keep this in mind. Back to baby steps. We are no longer entertained by the youngest child’s vegetable-matter-induced gagging-on-the-verge-of-throwing-up performances at the dinner table. We have gently made our picky eater understand that this behavior is disrespectful. And so, even though the phrase, “May I please have more broccoli?” simply does not exist in the child lexicon, the kids all understand that we don’t serve vegetables to kill or punish them. And eventually, the veggies get eaten. To occasionally ease the strain of enforced herbivory, what I have figured out is that as long as the veggies are undetectable, I can reliably get our picky eater to snarf them down without complaint. And the other night, when I served spaghetti casserole harboring an entire head of fugitive cauliflower, he raved about how fantastic it was. Hours later, at bedtime, he gave me a hug and told me—again—that dinner was AMAZING. To do this deed, cut up a head of cauliflower into florets and then boiling them until they’re easily pierced with a paring knife (no resistance). Drain the florets really well, add salt and pepper, and then purée until smooth with an immersion blender or food processor (they have enough moisture for our purposes, so don’t add additional liquid). Next, mix in some Italian herbs, and then combine the purée with ricotta cheese. (You can use skim-milk ricotta if you’d like to make this dish even healthier.) Mix in an egg, which will act as the binder for the casserole. Next, mix the cooked pasta with sauce, and then add in the ricotta mixture. 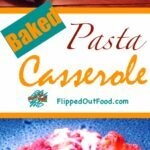 Add the pasta mix to your favorite casserole dish. Then, top with more sauce, sprinkle with mozzarella and Parmesan cheese (again, feel free to use lower-fat varieties if you want to cut calories), and cover with foil. Bake the casserole at 350º for 30 minutes. Remove the foil and bake for another 15 until the cheese is golden and bubbly. The resulting casserole seems ooey-gooey and decadent, but it’s only pretending to be that way. It’s always a big hit with the kids. We have even eaten it TWO nights in a row: the kids didn’t even blink. If you want to make your life even easier, you could use jarred sauce. I won’t tell anyone, though I’d suggest sauteéing some ground beef or Italian sausage and adding that to the sauce to give it more oomph. You could hide just about any mild-tasting vegetable in baked pasta casserole. I have also had success with spaghetti squash and zucchini. The spaghetti squash doesn’t even have to be pureéd (unless you want to be extra-safe), since its noodly appearance hides well among the spaghetti. I wish you luck in your veggie-delivery mission. Enjoy! This baked pasta casserole is pure, ooey-gooey deliciousness, but far healthier than most other bakes you'll find. The reason for this is the cauliflower hiding in the ricotta cheese, which takes on the flavor of—you guessed it—RICOTTA CHEESE. This is an excellent veggie-delivery system for the vegetable-averse, and is always a hit with the kids. I hope your family enjoys it as much as mine does! Preheat the oven to 375°. 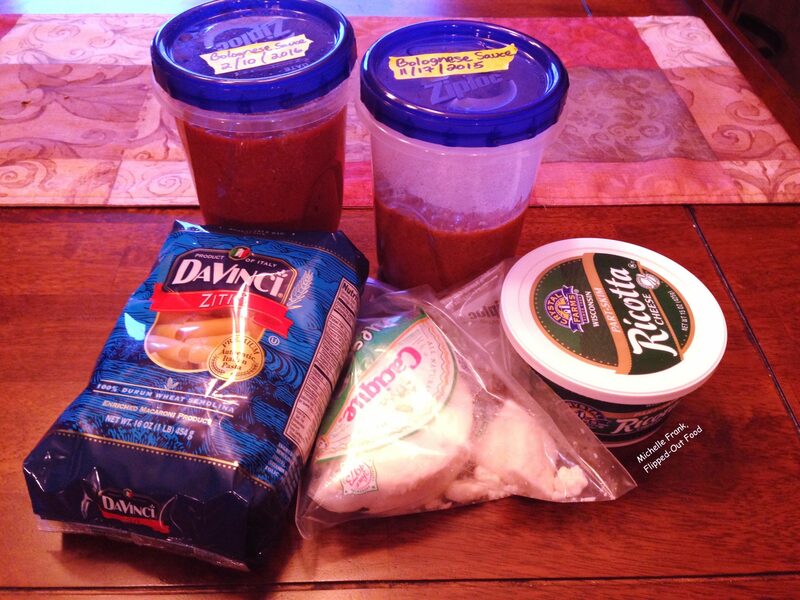 Warm your prepared sauce on the stovetop or in the microwave. Bring a large pot of salted water to a boil. Meanwhile, cut the cauliflower into florets. When the water is boiling, add your cauliflower and cook until a paring knife pierces the florets without resistance. Fish the florets out of the pot with a spider or slotted spoon, allowing the water to continue boiling. Rinse cauliflower with cold water for 30 seconds. Add your pasta to the pot and cook according to package directions (you want al dente, because the pasta will continue cooking in the oven). Meanwhile, add a pinch of salt and a dash of pepper to your cauliflower; purée until smooth with an immersion blender or a food processor. Add the (beaten) egg, herbs, and ricotta cheese; mix well. Drain your pasta well. Mix in 3 cups of your sauce and the ricotta/cauliflower mixture. Top with the remaining cup of sauce and sprinkle with mozzarella and Parmesan cheese. Cover with foil* and set on a foil-lined baking sheet. Place in the oven and bake for 30 minutes. Remove foil from casserole and continue baking for 15 minutes, or until golden and bubbly. Enjoy! My favorite sauces are homemade Marinara Sauce (like my Slow-Roasted Slow-Roasted Tomato Sauce or Vegan Pantry Marinara Sauce) or Bolognese Sauce. If you prefer to use your favorite jarred sauce, I won't tell. Why not follow me on Twitter, Pinterest, Facebook, and Instagram? PLUS, get easy dinner ideas and cooking hacks delivered straight to your inbox when you subscribe to the Flipped-Out Food Newsletter! 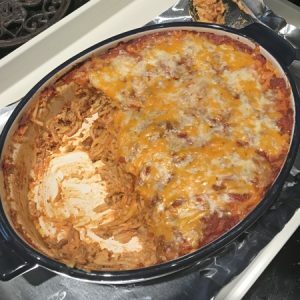 This easy Lasagna Bolognese recipe is part of my Bolognese-Lasagna One-Two Punch, a “saucy two-step” recipe where you make the sauce over the weekend and then use it for weeknight dinners: first, Spaghetti Bolognese, and then Lasagna Bolognese. Perfect Comfort Food! I love the two step sauce idea! This sounds like a great idea for a pasta craving! I have two very picky eaters myself! Sometime is a struggle to make them eat veggies. I love your idea of sneaking veggies into meals. Thanks for the tip! My kids would love this recipe. Perfect comfort food! This is something my kid would love to eat every single day 🙂 Even I make a big batch of sauces on weekends and freeze them to be used during weekdays when it gets really crazy. I am all for shortcuts and nutritious meals and this baked pasta casserole is just what I need for weekday cooking. I can’t even imagine how challenging it must be to come in to a family and have to figure out parenting… especially trying to make it easy on the kids when they already have two parenting styles to deal with! I love how you dealt with your picky eater. And this pasta is pure genius — I never would have guessed there’s pureed veggies in there! Id gobble this up in a heartbeat (I love veggies, but even so) and I’m sure kids would love it too. Hi Willow! It HAS been quite the learning experience, but also very rewarding. Thanks so much for stopping by and for your kind words! Thanks, Maria! It’s saved me on busy weeknights more than once! I love baked pasta casseroles. Thanks for sharing! 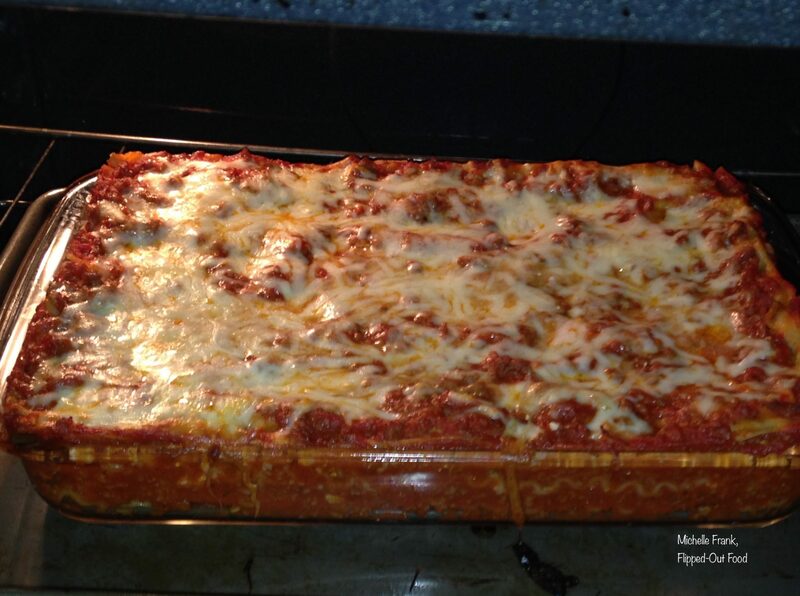 Pasta bakes are so much fun and so easy. Love hiding all the veggies in there! Thanks, Sarah! It’s my favorite veggie-delivery strategy!